When this issue rolled into my review box, I momentarily paused to consider how such a lucrative franchise had managed to avoid this medium for so long. 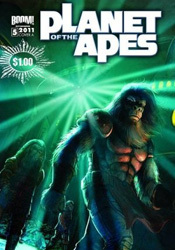 After all, the intelligent blend of sci-fi and fantasy seen in the Apes seres has typically fared very well in comic books, and without any concern for prosthetics and special effects to get in the way, the concepts and ideas behind the story itself could be reasonably expected to succeed. Well, a quick Wikipedia search later and the facts stand revealed: the 2011 edition is far from the first adaptation attempted with this license. Since the original film landed in theaters, no less than a dozen different publishers have tried their hand at the simian landscape, including several mangas, a three-year run at Marvel and a Dark Horse tie-in to the 2001 Tim Burton-helmed failed relaunch. Learn something new every day. Despite that long tradition of ill repute, however, Daryl Gregory's new interpretation might just wind up being the one that finally sticks. Like this year's big screen relaunch, it seems like Gregory can see beyond the masks, make-up and long-lasting catchphrases of the first film to the enduring message buried beneath. On the surface it's a sci-fi adventure with apemen riding saddled horses and humans thrashing wildly in their cages, but beneath that lies a complex, relevant message about segregation, society and racism of all shapes and sizes. Not only does the new series meet these issues head-on, but it does so with a hefty, diverse cast, a large-scale primary storyline and dozens of intelligent minor plot threads. And though this issue can at times be intimidating for new readers, its pace is deliberate enough for fresh faces to catch up quickly without feeling completely overwhelmed. Gregory's found himself a great match in Carlos Magno, too, whose sharp, vivid artwork is all the proof at-a-glance viewers need to tell Boom! Studios is serious about this series. Like former Wildstorm golden boy Travis Charest, Magno's work is richly meticulous, but sparingly so. Both artists speak volumes in the details of each panel, balancing the heavier portions of a layout with effective, strategic use of negative space. Naturally, Magno's contribution doesn't entirely benefit from such comparisons, as Charest's work is more evenly stylized and poetic, but the potential for similar growth is there. With a bit more finesse and a few more years at the table, Carlos could easily grow into a formidable talent. As it is, his artwork is a bargain for the $1 asking price. That last statement holds true for the full issue, as well. At a standard price, this effort would have received a firm "borrow"”" recommendation and a few words about its potential to move into my pull list somewhere down the line. At less than a third the price of most mainstream comics, though, it easily makes the leap up a level, making it a solid buy. The moody, cinema-influenced artwork might get the first hooks in, but it's the smart, multifaceted storytelling that'll bring readers back for more.